If you’re wondering how does video content marketing stand in the graph at this time, you should know that video content is expected to increase to the point of dominating all other forms of advertising. More, Cisco forecast estimates that 80 percent of all internet traffic by 2019 will be video content and a Search Engine Journal analysis predicts that global video traffic will increase threefold until 2021. With YouTube reaching more US 18-49 year-old during prime time than the top 10 TV shows combined, you could be missing an important part of the audience if you’re only advertising on TV. Actually, brands that advertise on YouTube rather than TV during prime time reach 56% more of this age group. YouTube currently reports a number of 1 billion users, which makes it easy for any business to target a potential audience for their products/services on the platform. 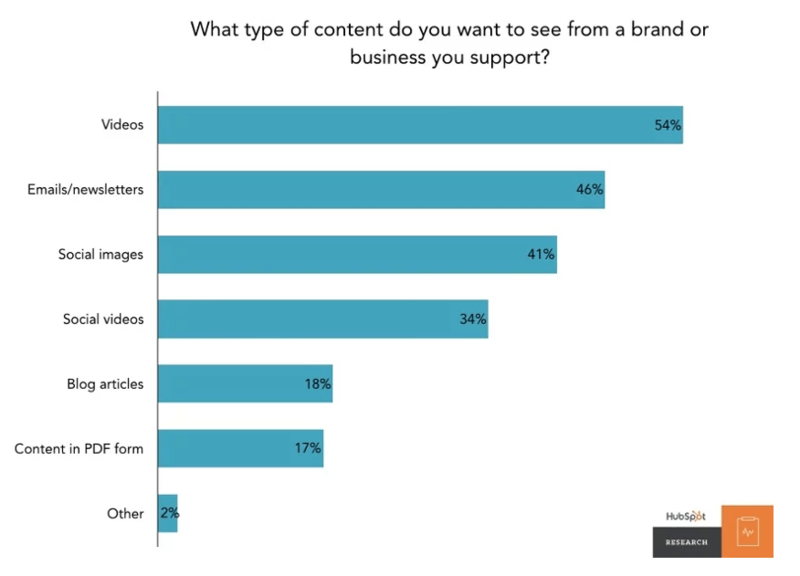 According to a HubSpot Research report, 54% of consumers want to see videos from brands they support in comparison to email newsletters (46%) or social image (41%) based content. We also found that video content was the most memorable (43%) in comparison to text (18%) and images (36%). What do you want your target to do after watching your ad? Purchase your product, download your e-book, contact you? Or simply get to know your brand and associate positive feelings with your brand? Determining your objective is the foundation of your online video advertising strategy. Once you have clearly articulated the marketing objective, everything else will flow: who is your target audience, which advertising platforms to use, what type of video you’ll produce and which message you will tell the world about your brand. 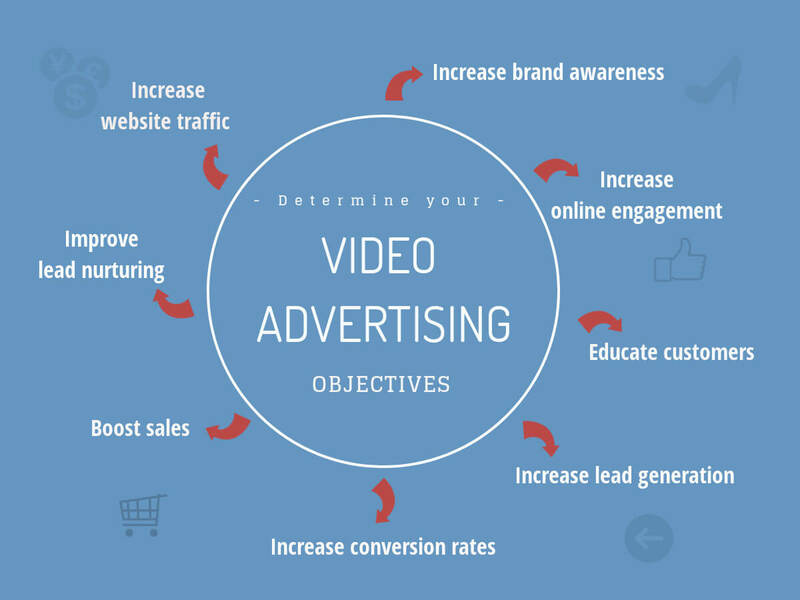 To make it easy for you, we’ve put together this graphic offering you a palette of video marketing objectives. If your goal is to increase brand awareness, you can go for videos which release your brand’s story, values, and contribution to the world. Branding should be a keyword here. Stream your brand’s color palette, logo, atmosphere, taglines. Whether you’re posting a video to increase brand engagement on Facebook, Instagram, Twitter or YouTube, there’s one thing you should keep in mind: the video must be engaging. What does this mean? First of all, the video should catch a viewer’s eye during the first 5 seconds. Then, you need to offer a truly compelling brand story or product presentation. And last but not least, ask people to engage with your video: what is their opinion on the product, how do they use it, how does your product contributes to making their life better? Use short how-to videos to educate your customers about ways they can use your products. Or you can create a series of marketing videos to tackle a big issue that your product solves. For example, you have an eco laundry detergent and you can create a series of video ads to talk about global warming and the chemical detergents that contribute to polluting the oceans or, at least, identify live video streaming content on this topic to use it later. In other words, if you want to build a database of potential customers, you must offer relevant content. If this content is a live video streaming one you should also have to pay attention to its quality. No one will give you their data unless they find you’re a valuable brand that can meet their needs. Advertising actions can determine a person to click a button, fill a form or order a product online. In the conversion process, simple things like a call to action or an appealing image can determine someone to perform an action. With videos, things get even more interesting. A truly compelling video released can trigger a user to watch your story start-to-end, click “Learn More” and even order online. According to a study performed by KissMetrics, leads are from 64%-85% more likely to purchase a product after seeing a video. In the absence of a sales representative to provide them with all the information they need to make a purchase, people find streaming videos equally relevant. Lead generation can sometimes be useless if you don’t follow-up with lead nurturing activities. You need to create a bond between you and your potential customers and help them progress in the sales funnel until the moment of purchase. Video advertising can help you nurture your leads and transform potential customer into purchase makers, through compelling videos on how your product’s benefits solve their problem. Video advertising is a great way to direct people to your website where they can learn more about your brand and products/services. All you need to do is create eye-catching videos to trigger people’s attention and end with a call to action that invites people to discover more/win something on your website. You cannot afford to target everyone and why would you do so? A well-defined target audience is all you need to build your campaign and message. Analyze your product/service and list down the benefits it offers and the needs it meets. Analyze your current customers. Are there common characteristics like age, gender, location, interests, education, purchase behavior? Unlike TV or print media, digital media allows you to reach people that are highly likely to be interested in your product/services. All major online advertising platforms (Google Ads, Facebook Ads, Yahoo) allow you to create custom audiences, by choosing your preferred demographics like age, gender, location, interests. For example, Facebook allows you to create custom, saved and lookalike audiences. Facebook Ads Manager offers so many possibilities (for both Facebook & Instagram) to reach potential customers. All you need is a bit of patience to get to know them all. When running a video campaign, you can either edit and select your target’s characteristics manually or import a customer file (for example an email marketing contacts list) and they’ll immediately come up with suggested people that are very similar to your current customers. Using Facebook Pixel, Facebook will automatically track people taking specific actions on your website and add them to your customer list. Similarly, integrating a SDK in your app, Facebook will add anyone taking indicated actions within your app to your customers list. 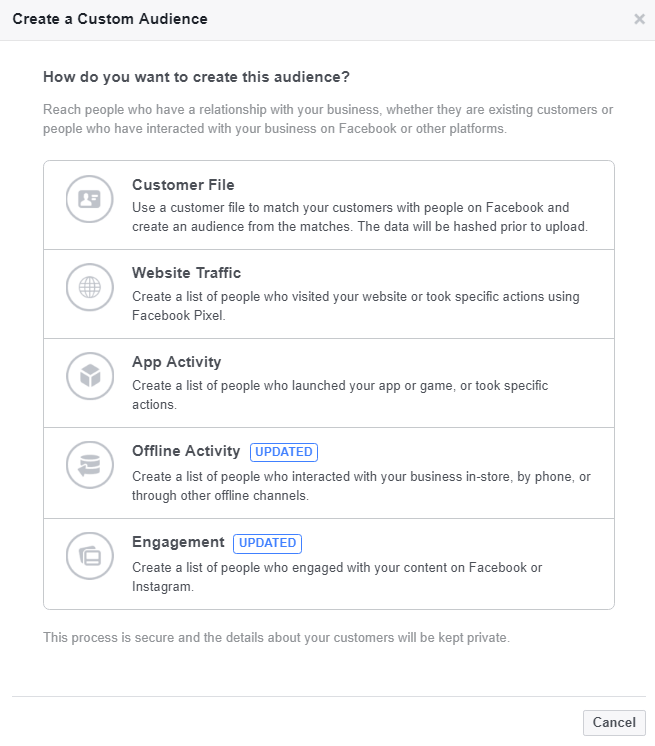 In Facebook, you can use saved audiences to create segments of your main audience group based on various characteristics. You can use the saved audiences whenever you want to promote specific products. Once you’ve defined your saved audiences on Facebook, you can use them for multiple campaigns. This is a great time-saver for any busy PPC person. 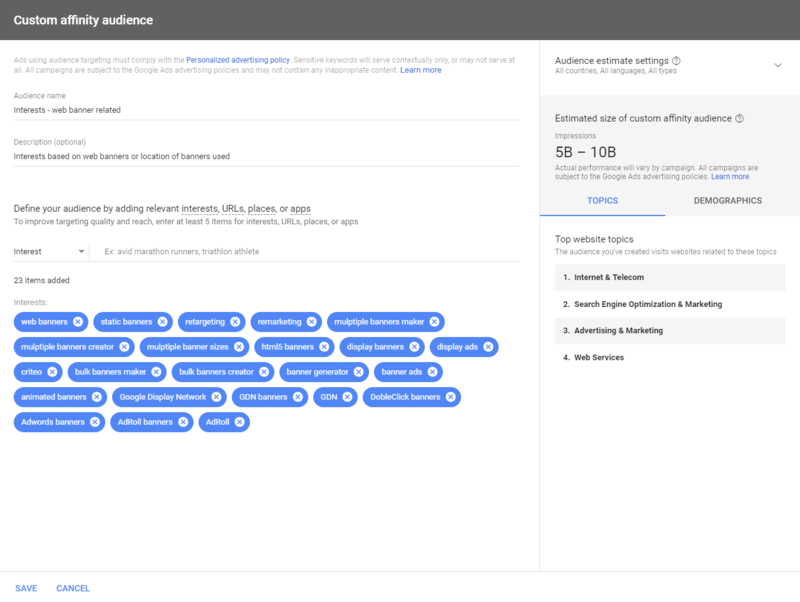 Both Google Ads and Facebook allow advertisers to employ audience lists based on similar characteristics. In Facebook, this option is called Lookalike audiences. With the Lookalike option you can reach people who are similar to your Facebook page fans, people tracked by Facebook pixel or people similar to your email customer list. While Facebook allows marketers to adjust the size of the Lookalike audience, they recommend keeping it between 1,000 to 50,000 people. This feature might be of interest to you, as Facebook allows you to create up to 500 Lookalike Audiences from a single source audience. Google keeps track of the searches we make, the sites we visit and even the actions we take on those websites. With this abundance of information about each and every one of us browsing the internet, Google is able to provide marketers with insightful data such as affinity interests and even intent actions. Therefore, when running a video advertising campaign through Google Ads, it is possible to reach the exact people interested in what you offer and pay only if they watch your ad (or at least 30 seconds into your ad) or clicked your link. People who visited your competitors’ websites. Typing your competitors’ URLs in Google Ads audiences set up is like telling Google to find the people who have visited your competitors in the past and placing the order to show them your video ads. People who use/installed apps from the same industry/category as yours. Google also offers the possibility to target viewers based on their past interactions with your website, videos, TrueView ads or YouTube channels. This is called remarketing and in case you’re not using it, you may want to. Google recently announced changing AdWords into Google Ads. They also created Google Marketing Platform, and Google Ad Manager. Another innovation is that they made their products more accessible so that small businesses can easily set up their campaigns without heavy lifting. 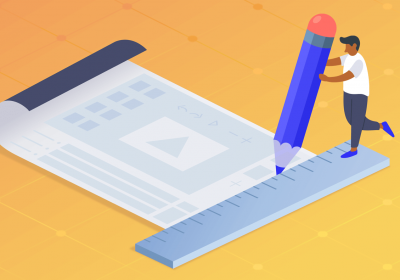 If that sounds like you, check out this post to learn how to set up Google Ads video campaigns. You choose your target audience through refined setups based on audience interests (keywords past search), behavior (visited websites and interactions) and similarities. Your ads will be played on YouTube and all the other Google Ads partner sites and apps. You’re only charged when viewers watch 30 seconds into your ad (or the duration if it’s shorter than 30 seconds) or interact with elements of your video. Use this format if you’d like to promote your video ad before, during, or after other videos on YouTube and across the Google Display Network. After 5 seconds, the viewer has an option to skip the ad. If you want your video ad to be discoverable when people search for specific keywords, use this format. This type of format will promote a video in places of discovery, including next to related YouTube videos, as part of a YouTube search result, or on the YouTube mobile homepage. A bumper video ad is 6 seconds or shorter and plays before, during, or after another video. Viewers do not have the option to skip the ad. 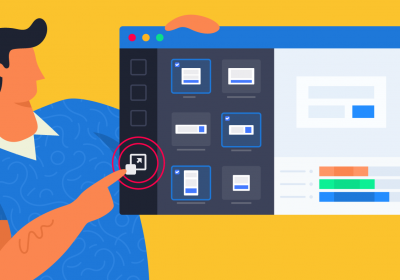 With Facebook Ads Manager, you can set campaigns for both Facebook and Instagram (at the same time or individual) and on a selected list of apps and websites from the Audience Network. This ad system was designed to help you easily set up campaigns, add your content, choose audiences and get reports about your campaigns. On Facebook, you can run video ads in the newsfeed, in-stream videos (before, during or after a video), as side video suggestions, and as stories. Video ads will probably be included in Messenger too, but currently, this option is not available. On Instagram, you can only run newsfeed video ads and stories ads. 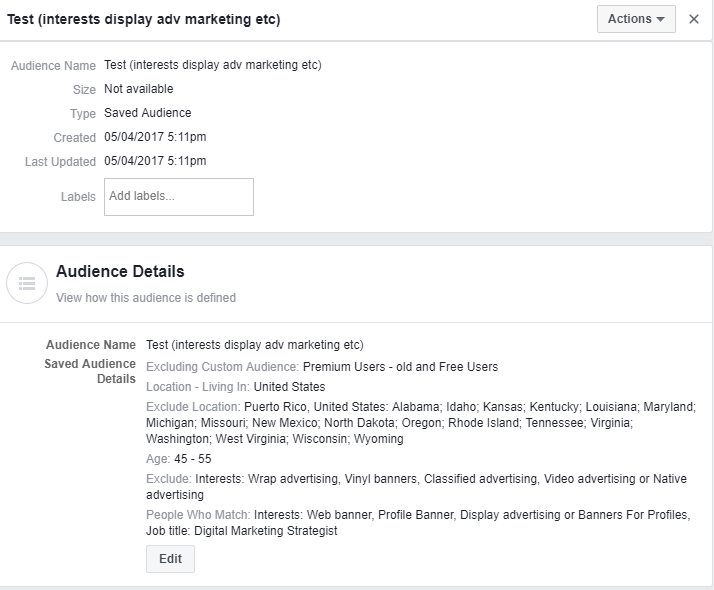 Target your ads to specific groups of people based on their interests, location, age, gender, previous behavior on Facebook. Get reports about the performance of your campaigns. You can see what was the reach of your video ad, how many people interacted with your ad, how many clicked the link and the total spend. You can even manage your ads on mobile, using their Ads Manager App. For video ads on without links, use full portrait (9:16). Facebook recommends ensuring the most important parts of your video also display within the vertical (2:3) aspect ratio for optimal rendering in News Feed. Facebook advises designing for mobile first. The formats are square (1:1) and vertical video (4:5, 2:3 and 9:16). These formats can be most engaging as most people hold their phone upright. While a few years ago everybody was running 30+ seconds videos, now videos over 15 seconds is risk being left. The reason for this is the large number of video content. People now find video after video as they scroll down the feed. Most people watch videos with the sound turned off. So you need to make your message heard even when the sound is off. Use captions for the sound off mode, but use great sound for the sound on mode too. Instagram supports 1.91:1 – 4:5 for all feed videos across all objectives. For Instagram Stories, the recommendation is 9:16 and 4:5 to 1.91:1. If you have a video and would like to run a campaign on both Facebook and Instagram, use the vertical (4:5) format. 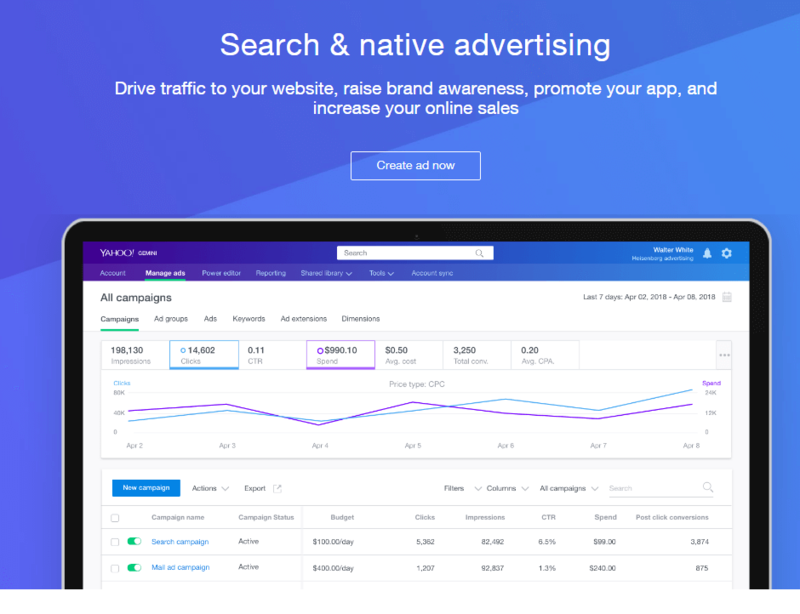 Yahoo has its own advertising platform, called Gemini. Using this platform, you’ll have your video ads running on all selected Yahoo products (Yahoo Mail, yahoo search, Yahoo Entertainment), apps and their partner sites. You can import your Google Ads campaigns by syncing your account to Gemini. Any change you perform on Google Ads will be reflected in Gemini. The possibility to set up your campaign, choose the audience and the budget. Access to Yahoo’s dedicated audience using Yahoo Mail and apps. Video Resolution: 1080p – 1920×1080 (recommended), or 720p – 1280×720 (minimum). 15 seconds max animation time. Skip Button is required to be visible after 5 seconds. 3-10 seconds max animation time. Check out all the formats supported by Yahoo Gemini here. 4. Which advertising platform is suited for video marketing your business? Before choosing your advertising platform or platforms, you need to analyze the nature of your business. Is your business local? Do you sell services worldwide? What is the preponderant gender of your target audience? For example, if you own a local bakery, it would be useless and a waste of money to advertise on Youtube or LinkedIn. Instead, focus on your location, and run some Facebook and Instagram video ads targeted at your specific area. If you’re selling women’s lingerie online, don’t go to LinkedIn or Yahoo Gemini. Advertise with platforms where women make up a substantial part of the general audience, like Instagram, Facebook, and Youtube (specific channels for women). Another key point you should take into consideration when choosing your advertising platform is your budget. If you’ve got a 20 dollar a day budget, don’t go Google Ads. Keep it small with Facebook or Twitter ads. Smartphones are more accessible today than ever, and Internet connection is now a default utility as part of mobile plans or bundles around the globe. Which leads to people spending more time on their phone than on desktop computers for entertaining activities such as checking on the mail, Social Media feed, chatting, catching up on showbiz gossip, watching YouTube videos or even movies on Netflix. 56% of mobile and 57% of tablet users search for products on a weekly basis, compared to only 37% of consumers using desktop. 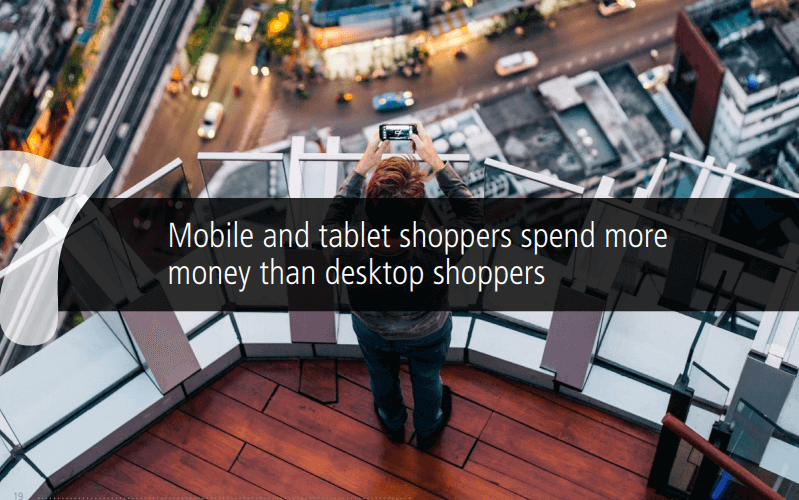 35% of mobile and tablet shoppers buy products at least once a week, compared to only 15% of desktop users. 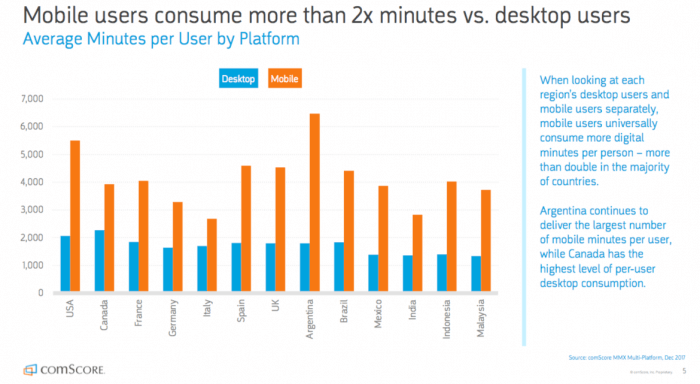 Desktop users are being outspent by mobile and tablet users ($64 to $71, respectively) per month and mobile users are two times more likely to make purchases of $250 or more than desktop shoppers. So, you may want to ponder on these stats before setting up your video marketing campaigns. 6. Where in the sales funnel should you place your video content? How acquainted with your ad campaign he is. The more contacts he had with your ad, the more chances he will convert or make a purchase. 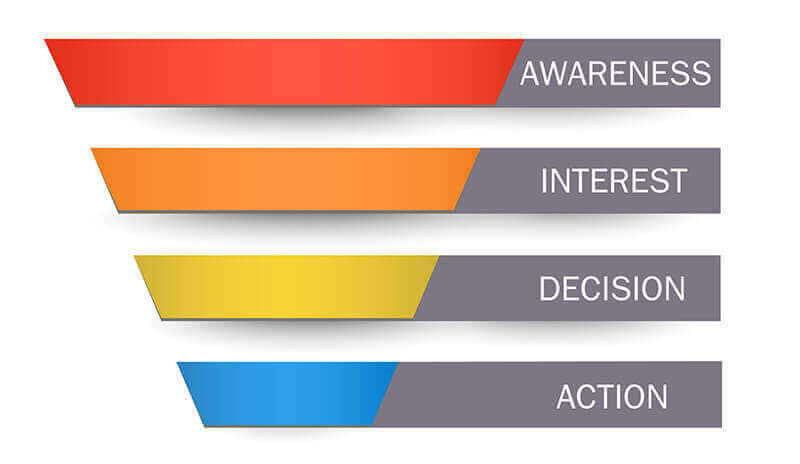 As an advertiser, you should not overlook any stage of the sales funnel, because decision making is a process that develops in the customer’s’ mind. The process implies “digesting” information about a specific brand/product/service, pondering on its benefits and utility and finally making the purchase. Depending on your type of objective, brand history or product release, you should design your whole campaign based on the specific funnel stage your brand/product/service is at. Another way of looking at this is to create various groups of audiences and target them with your video ads until the moment they make the purchase. Thus, you need to create more than one simple awareness video. Create multiple videos for each funnel stage, track your customers and retarget them based on their behavior. 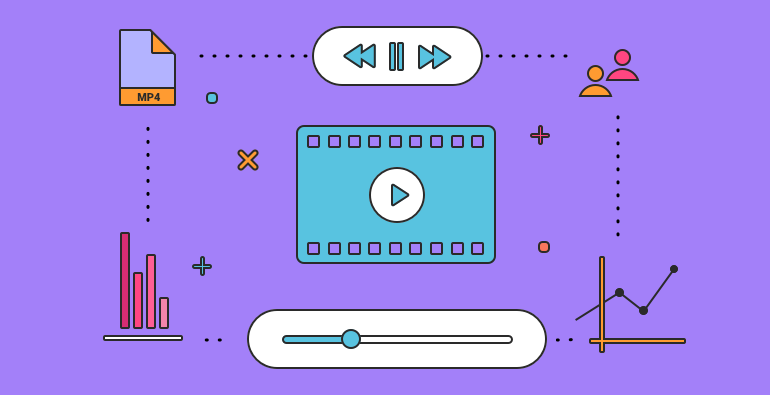 This is the smart way to approach an in-stream video marketing campaign. There’s no advice on budget that can suit everyone. You know your business and your revenue, and you’re the only one who can take the decision on how large the budget for your video marketing campaign will be. Choosing a percentage of your total income that you want to invest in video advertising. Or allocating a fixed amount of money. Either way, you’ll need to split that amount on various advertising platforms, if you want to cover more than one platform. Read more on how to calculate your budget here. 8. How to avoid ad fatigue? First, what is Ad fatigue? Use various ad placements. Work with multiple advertising platforms to ensure your video ad is shown on different Social Media channels, websites, and apps. Create several video banner ads and rotate them. Exclude people who have engaged with your ads. Now that you know more about video advertising, you can kick off your video content marketing strategy. Define your objective, know your audience, choose an advertising platform, integrate the campaign into the sales funnel, and finally calculate your spend. Next: produce your videos and launch your campaign.